$0.62 Lipton Green Tea w/ Coupons! 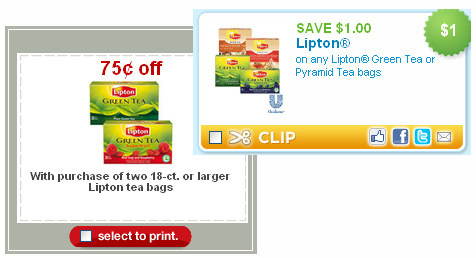 You can get a great deal on Lipton Green Tea Bags at Target by stacking a few coupons! = $1.23 for 2, or $0.62 each! Keep in mind that prices may vary slightly by store and region. Several people have found them for $1.77, which would make them even cheaper!